As we studied many of the great artists in our focus book, Vincent Van Gogh's Cat, we branched out to learn about some more modern artists, too. One of them was Piet Mondrian. 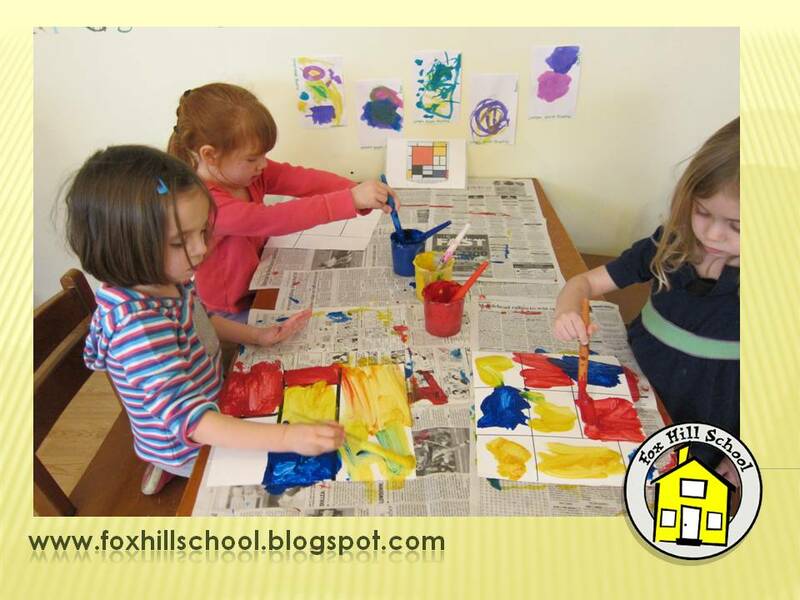 Many of his paintings are made with straight lines and primary colors so his art was fun and easy for the preschoolers to use as a model. We used heavy card stock and taped black painter's tape in various straight line patterns on the paper. Then the kids used tempera paints to make their Mondrian-style creation. Many of these were displayed at our FHS Art Show! 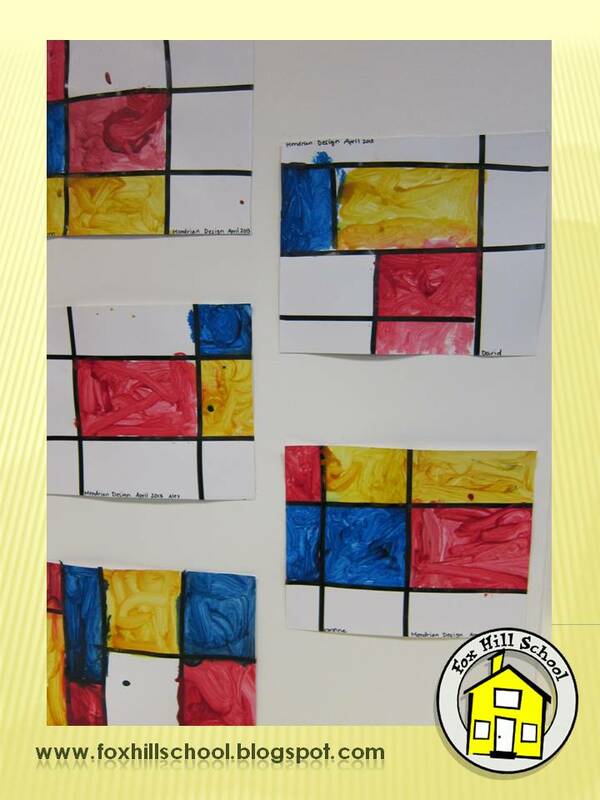 Another activity the kids explored was to try and make a Mondrian-style "painting" in the block area! We supplied them with primary colored pieces of construction paper in various sizes and challenged them to create something that looked like a Mondrian painting. It was amazing to watch them putting the pieces together! Each group of kids had their own strategy about how to do it. 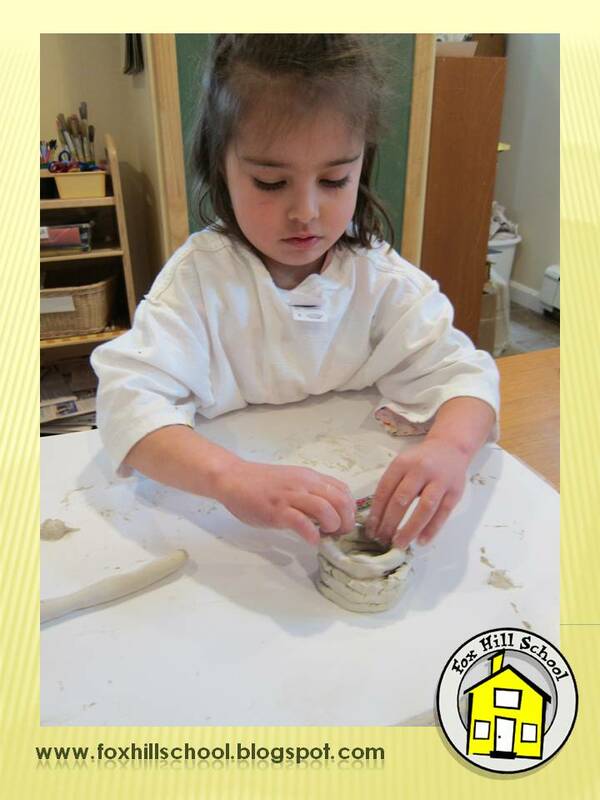 Not only was this a fun way to explore art, but a great activity for spacial relations, too! Click on the pictures below to purchase these great art books from Amazon. 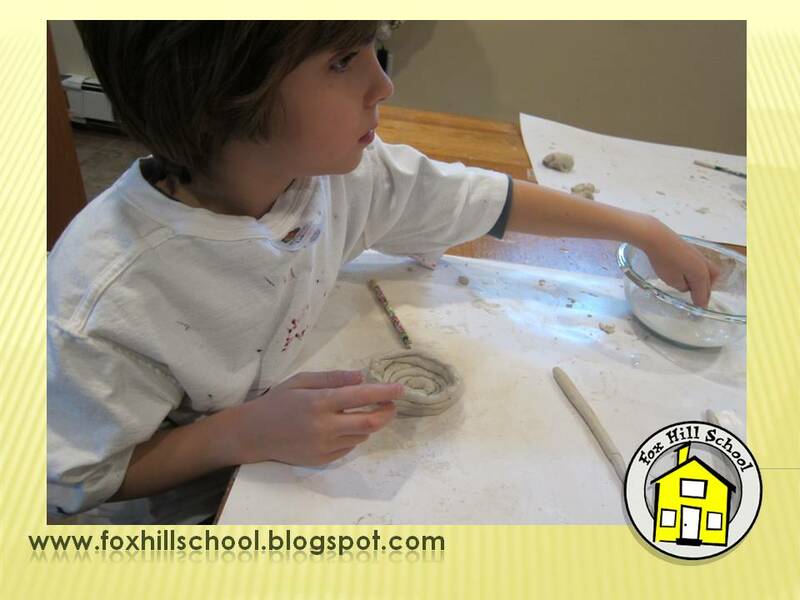 The Fox Hill School was on April Vacation last week. Before our week off we had our annual art show! 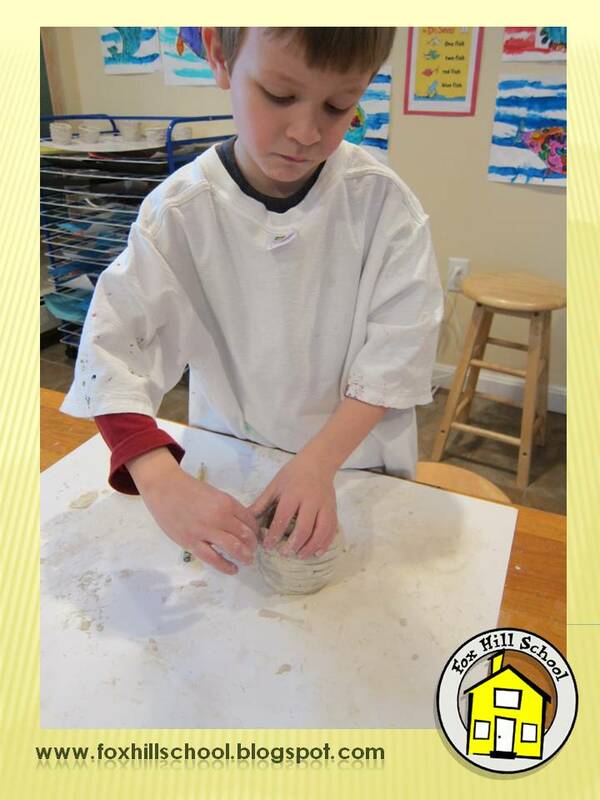 This year the show featured kids' work from both of our programs: PreK kids from the Fox Hill School and all the kids from the Fox Hill School PreK/Kindergarten! As they say - a picture is worth a thousand words so click below to view a montage with photos from our art show. Jackson Pollock has to be one of the favorite artists of preschool and Kindergarten aged children. How can you blame them? What's more fun than throwing paint?!? 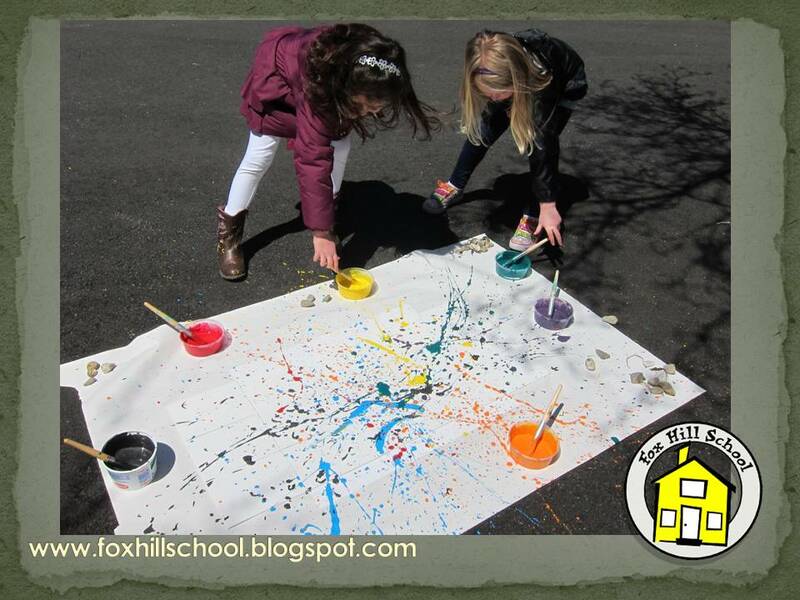 Our art show is coming up this week and I wanted the kids to make a Pollock inspired piece to display. Many sites on the internet that I have visited and books about children's art have all kinds of different ways to emulate Pollock's art without getting messy. 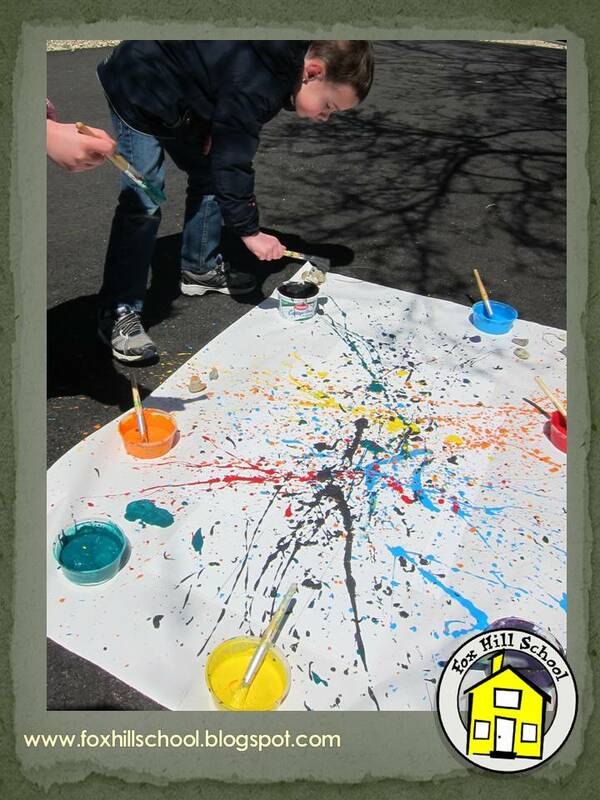 I'm all about getting messy so we brought the project outside and let them fill their canvas in true Pollock form! In the past we have made one big canvas to display at school. This time I wanted each of the Kindergartners to have a canvas to take home so I taped 15 canvases (5x7 sized) together and had them work on the painting together. Then after the piece is displayed at the art show, they can each take a canvas home! These are a few photos of the masterpiece in the making and I will post the finished product after the art show! Here are some of the books we have about Jackson Pollock in our classroom. Click on the picture to purchase from Amazon. 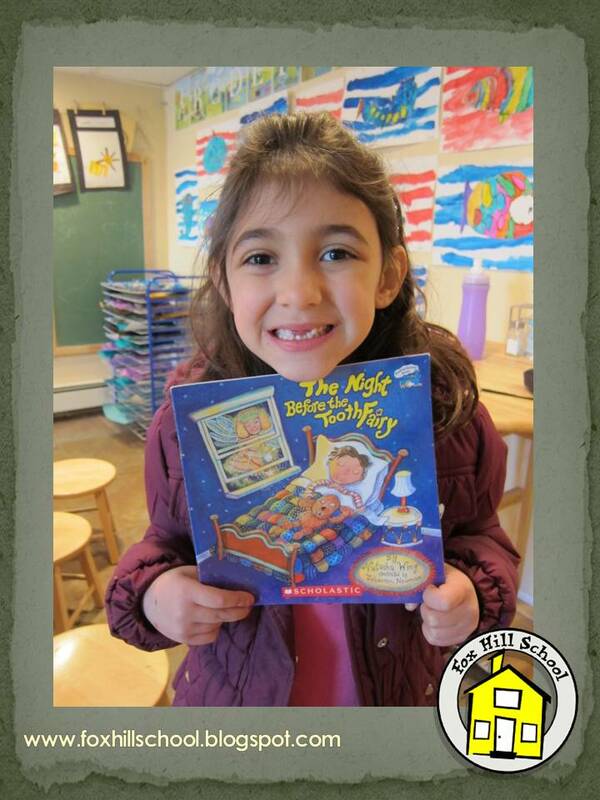 Lost a Tooth, Gained a Book! All of the curriculum at the Fox Hill School is based on children's literature so needless to say, we love books! As you are probably aware, Scholastic has a wonderful program for schools that helps them build their classroom libraries. When parents order books from the Scholastic Book Club the school earns points that can be used to get new books. In addition to building our classroom libraries, we also like to use the points to buy books that we can give away to the children in our program. 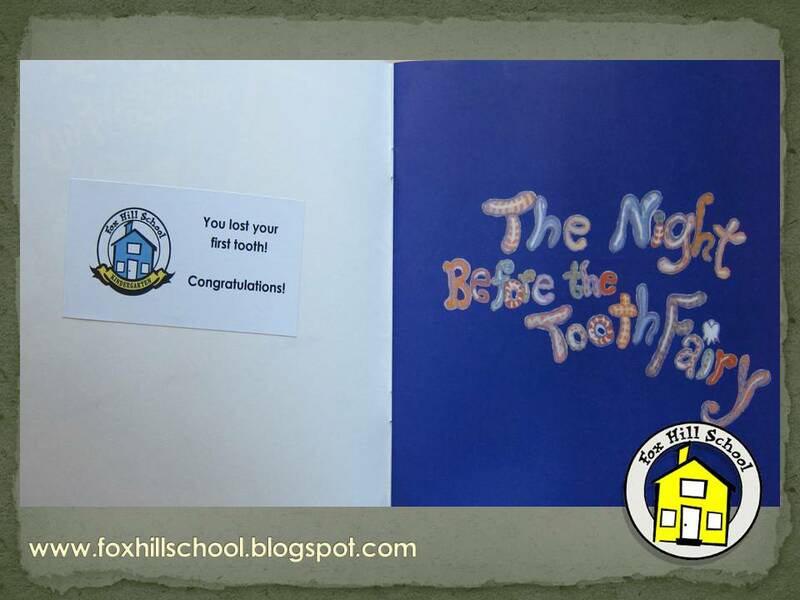 For example, at the Fox hill School Kindergarten, many kids lose their first tooth during the school year. When that happens, we give the child a copy of The Night Before the Tooth Fairy by Natasha Wang with a sticker inside the front cover congratulating them on this milestone. This is a no cost way to encourage the kids in your program to read while recognizing an exciting time in their life a the same time! Click here to view books about losing teeth currently available from Scholastic! There are simple ways you can expose your students to science every day. 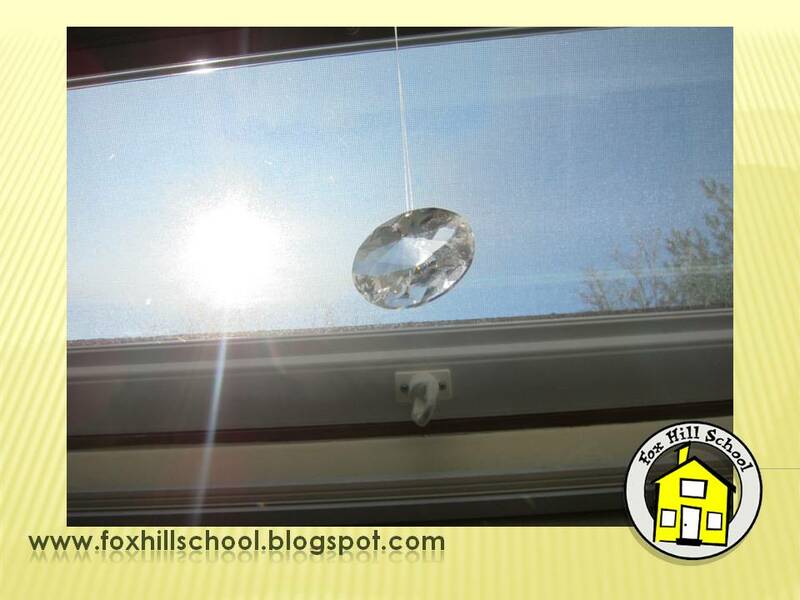 One of the favorites at the Fox Hill School are crystal prisms. We have these hanging in the windows and skylights at the school. At the beginning of the year we explained that when sun goes through the prisms, it creates rainbows! The kids love to find where the rainbows are around the room at the different times of day. They have also realized that when the weather is not sunny, the prisms do not make rainbows. It's been a long snowy winter here in New England so needless to say, the reemergence of the rainbows in our classroom this week has been very exciting! 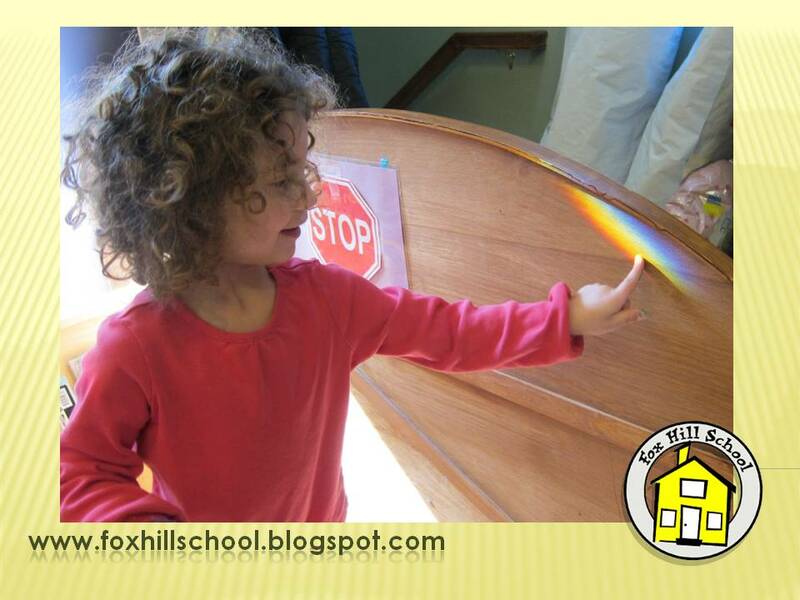 One activity we like to have the kids do is to try and "catch" the rainbows around the room. They get their clipboards, index cards and colored pencils and place the clipboard on the ground or wall under the rainbow. The kids use the colored pencils to color the rainbow as it shows on their paper. Then they can take the rainbow home with them! The crystal prisms are very inexpensive and once they are up you have a constant science lesson in your classroom! You can get crystal prisms at Michael's or A.C. Moore or click on the picture below to purchase from Amazon! 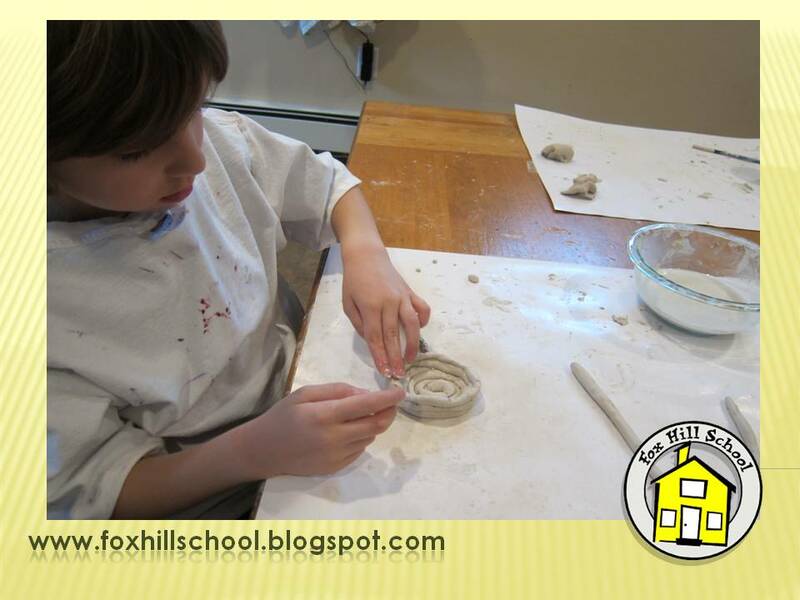 We rotate our materials quite often at the Fox Hill School to keep things new and interesting for the kids. The same goes for our block area. We don't always have blocks out. Sometimes we have straws! If you already have this fantastic product at your program, you know how great they are. 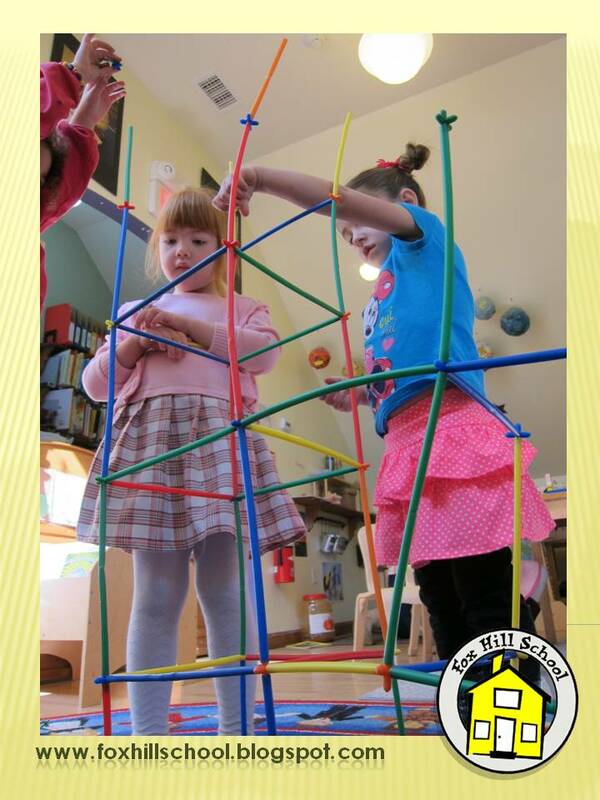 If you don't, this is a wonderful toy that the kids love and is a great material to rotate into your block area. It is very simple - straws and connectors and away they go! 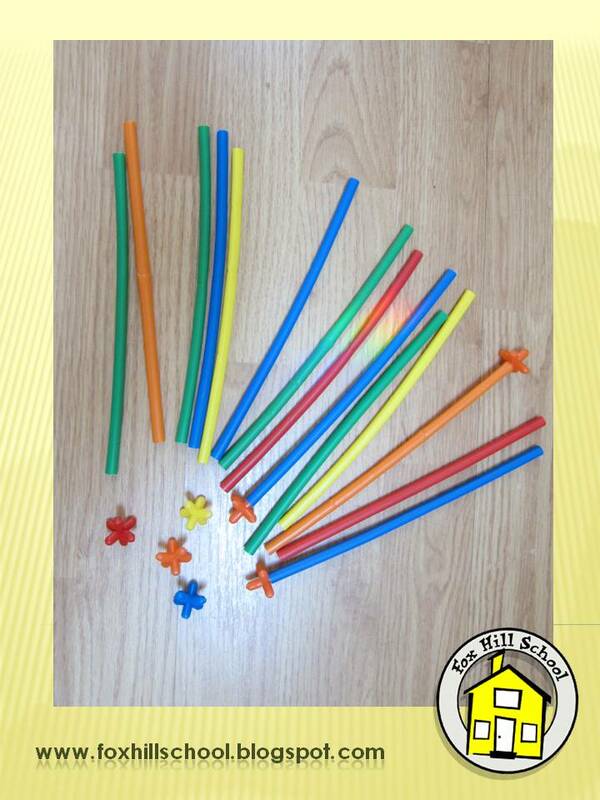 This is a great fine motor activity because of the tiny connectors used to hold the straws together. Straws are also a super tool for learning spacial relations. The first couple times kids use them, they usually make long, flat structures. Once you show them that they can also build UP and OUT, it's a whole new ball game! 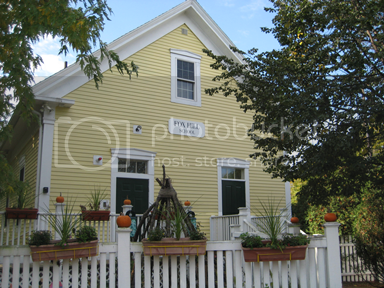 As you can see from the photos, they are also a wonderful toy for promoting collaborative building projects. 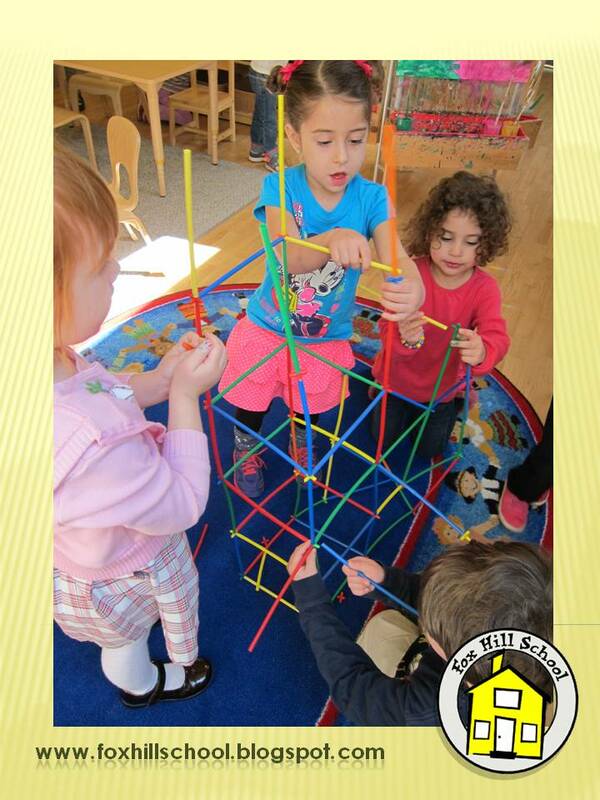 Since there are many connectors all over the structure, it is easy for kids to join in and help with a building project. No arguing on this construction job! I played with something similar to this product back in the Jurassic period when I was young. Sometimes the old-fashioned toys are even more exciting that the new flashy ones! Put the straws out in your block area and watch the magic happen! Don't have straws? Click on the picture below to purchase from Amazon! No Toil With The Coil! I love doing projects with clay with my students, but sometimes I find it can be intimidating for them. They like to make flat things out of the clay instead of using the clay to make something 3-dimensional. 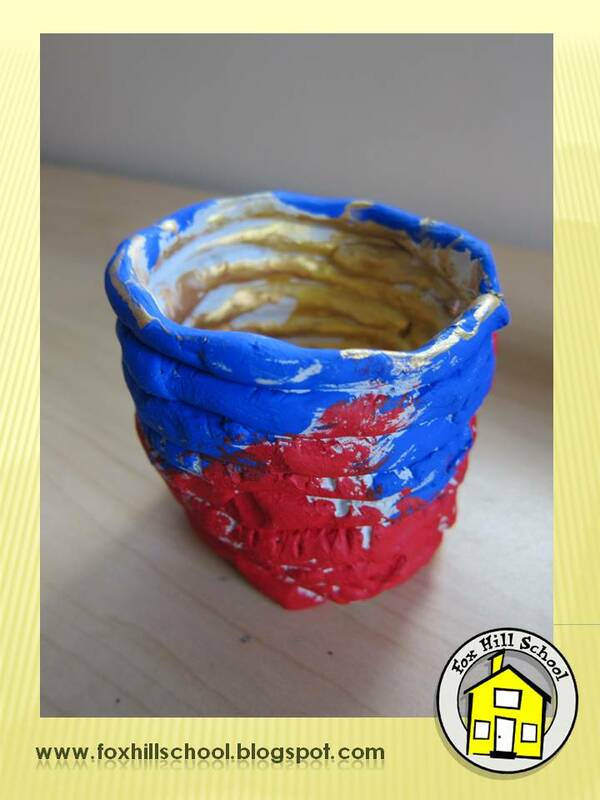 We've made pinch pots in the past which they enjoyed but the pinching part did not come easily. 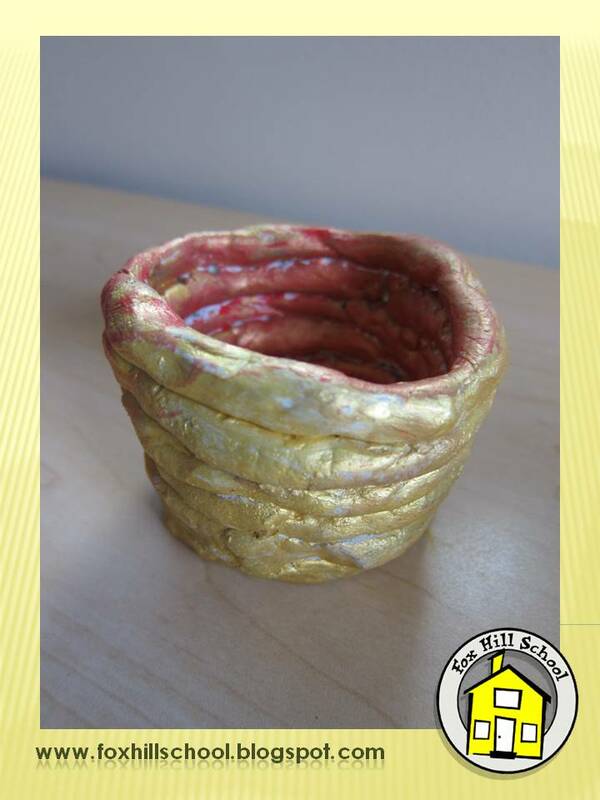 It is a very good fine motor art activity but if you want a clay activity that is right up their alley, try making coil pots! 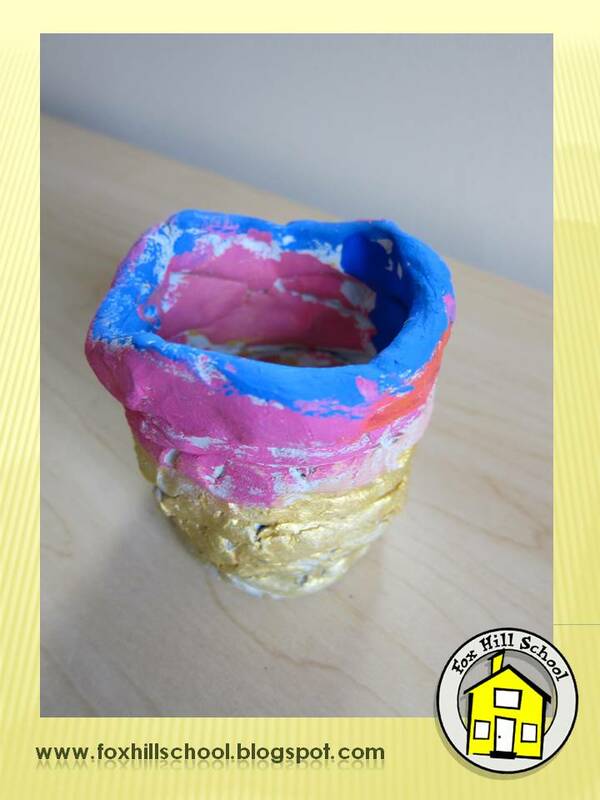 Every kid can make a snake out of clay or play dough and this project puts that skill to good use! First I had the kids make 8-10 snakes out of their clay. Then they rolled the first snake to look like a snail. This is the bottom of the pot. Then they scored the clay (made little hash marks) on the top with a pencil and wet the clay with a slip (water with a little clay mixed in). Then they added another snake to the top of their pot. They continued with the score, slip and stack method until all of their snakes were stacked on their pot. They were able to do this quite easily with minimal help from me. They liked using the art words "score" and "slip" - they sounded like real little artists! When they were done stacking, they used the slip to smooth either the inside or outside of their pot together so the coils wouldn't separate when they dried. The next art class we painted the pots with acrylic paints, as they show up much better on the clay than tempera paints. Here are a few of the finished coil pots! They are so excited to have their coil pot creations on display at the art show next week!